Determined teenagers attending school six days a week in effort to achieve their full potential. DETERMINED teenagers are attending school six days a week in an effort to achieve their full potential. 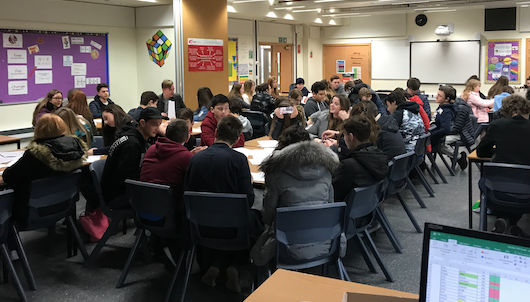 Aspirations sessions have been launched on Saturdays at Epping St John’s School, in Epping, to give Year 11 students extra time in the classroom to prepare for their GCSE exams. Sessions focusing on every subject are being offered throughout the weeks leading up to the summer’s exam season, with three different sessions held each week. Eposi Ewomi, acting assistant headteacher, said: “This is a new thing for Epping St John’s School. “Each week, we are seeing an increase in the number of students taking up this opportunity. Great communication with parents means students know exactly which sessions they should be attending and when. Students are encouraged to attend and feedback from parents has been positive; parents are seriously on board with this. “We are bridging gaps, enhancing subject knowledge and giving students an opportunity to spend more time with their teachers if they need something explaining again. As they say, practise makes perfect and the more sessions they attend, the better it becomes for them. The Saturday school is the latest opportunity offered to students who can also attend after-school aspirations classes, such as homework club, independent study club and peer teaching sessions. They also now spend three morning form times per week learning maths, science and English with their subject teachers. Mrs Ewomi said: “There are so many opportunities for our students. The morning sessions are ideal for those who are unable to stay after school; there is something for everyone. Study sessions will also be held during half-term. Students earn aspirations sessions attendance points which can be converted into rewards such as pizza parties and trips.